As of this week, Cricket Wireless is selling a relatively new Samsung smartphone - the Galaxy Halo. The handset is only relatively new because it's just a rebranded (and slightly different) variant of the Galaxy J7 Perx, which has been available since earlier this year on Sprint and its prepaid brands. The Galaxy Halo is sold by Cricket for $179.99 (no contract required), and comes only in black. 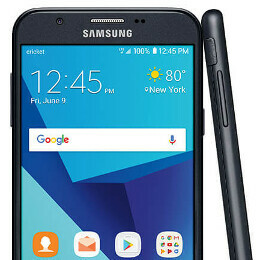 The smartphone offers LTE connectivity and support for HD Voice, sports a 5.5-inch display with 720 x 1280 pixels, and is powered by an octa-core processor clocked at 1.6 GHz (most likely, this is a Samsung Exynos 7870). Other features include an 8 MP rear camera with LED flash, a 5 MP front-facing camera, 2 GB of RAM, 16 GB of onboard storage space, and a 3,300 mAh battery. Right now, the Samsung Galaxy Halo runs Android 7.0 Nougat, and it's not clear if it's going to be updated to Android O - although we certainly hope it will. If you're interested in buying the phone, you can find it at Cricket at the source link below. Yes, I know that Samsung devices bring in a premium price, and yes, it has an Exynos octa-core processor and a 3300mAh battery in it, but, otherwise, I can get these kinds of specs on several other devices a considerable way below this pricepoint. This Samsung Galaxy Halo is about $80 too expensive for me, and it has Samsung’s backward navigation button layout, which is the opposite of what I’m used to. I think I’d rather get the LG Harmony, or the Alcatel Pulsemix, or the Coolpad Canvas, which should all be below $100. Also hoping the Nokia 3 and the Motorola Moto E4 show up in Cricket’s lineup for decent prices (they’ll be below the price of the Samsung Galaxy Halo at any rate).